Features: 100% brand new and high quality!alkaline waternegative potential wateradd beneficial microelementsenergizes water with small molecular clusters structureregulates the ph balance for a more alkaline environment for vitality and harmony. Breaks down water molecules for better absorption of nutrients and minerals through reverse osmosis, oxygenating the body and increasing metabolic rate. How to use: 1. Before using, put in a bottle filled with water and shake vigorously for 1 minute and empty. 2. Fill bottle, shake about 10 times, wait 15 minutes. The longer the water sits with the stick submerged, the stronger the ionization and the higher the ph. 3. It is best to drink your ionized water fresh. 4. You may dry the stick between uses if you wish. 5. Use one stick for a bottle of 500ml. 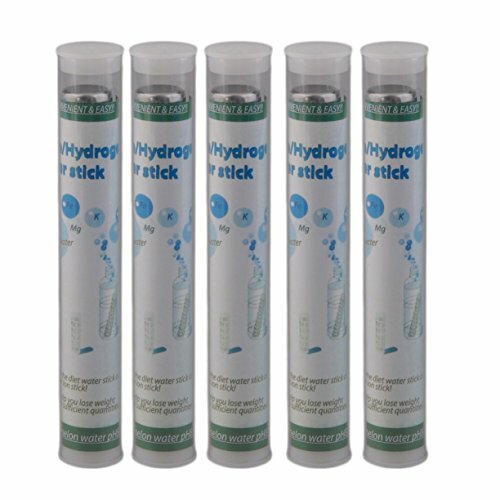 Use two sticks for 1l bottle, or more sticks for faster, stronger ionized drinking water. 6. Sticks will last about 90 days making 1 liter of water per day. Replace when smelling chlorine again. Product properties: item type: braces & supportstype: portable/travel filterquantity: 5 pcsbrand name: noeffect: improve sleepmaterial: stainlessfiltration method: alkaline ionizerspecification: color: silverproduct dimension: 15.5*2.2 cm/ eachpackage dimension: 18*14*2.2 cmpackage included: 5 x small molecule energy water activating water stickplease note: due to the difference between different monitors, the picture may not reflect the actual color of the item. That is hand measurement, so have 1-3 cm difference, pls understood us. Thanks!